(Fox News) AP - CINCINNATI – Neil Armstrong was a quiet, self-described "nerdy" engineer who became a global hero when as a steely-nerved U.S. pilot he made "one giant leap for mankind" with the first step on the moon. Armstrong died Saturday following complications resulting from cardiovascular procedures, a statement from his family said. It didn't say where he died. Armstrong commanded the Apollo 11 spacecraft that landed on the moon July 20, 1969, capping the most daring of the 20th century's scientific expeditions. His first words after setting foot on the surface are etched in history books and in the memories of those who heard them in a live broadcast. The moonwalk marked America's victory in the Cold War space race that began Oct. 4, 1957, with the launch of the Soviet Union's Sputnik 1, a satellite that sent shock waves around the world. An estimated 600 million people -- a fifth of the world's population -- watched and listened to the moon landing, the largest audience for any single event in history. A man who kept away from cameras, Armstrong went public in 2010 with his concerns about President Barack Obama's space policy that shifted attention away from a return to the moon and emphasized private companies developing spaceships. He testified before Congress, and in an email to The Associated Press he said he had "substantial reservations." NASA chief Charles Bolden recalled Armstrong's grace and humility in a statement Saturday. "As long as there are history books, Neil Armstrong will be included in them, remembered for taking humankind's first small step on a world beyond our own," Bolden said. At the time of the flight's 40th anniversary, Armstrong again was low-key, telling a gathering that the space race was "the ultimate peaceful competition: USA versus U.S.S.R. It did allow both sides to take the high road, with the objectives of science and learning and exploration." "He was a good friend and he'll be missed," Glenn told the network. The third astronaut on the mission, Michael Collins, circled the moon in the mother ship Columbia while Armstrong and Aldrin went to the moon's surface. Armstrong was born Aug. 5, 1930, on a farm in Ohio. He took his first airplane ride at age 6 and developed a fascination with aviation that prompted him to build model airplanes and conduct experiments in a homemade wind tunnel. He was licensed to fly at 16, before he got his driver's license. Armstrong enrolled in Purdue University to study aeronautical engineering but was called to duty with the U.S. Navy in 1949 and flew 78 combat missions in Korea. After the war, Armstrong finished his degree and later earned a master's degree in aerospace engineering from the University of Southern California. 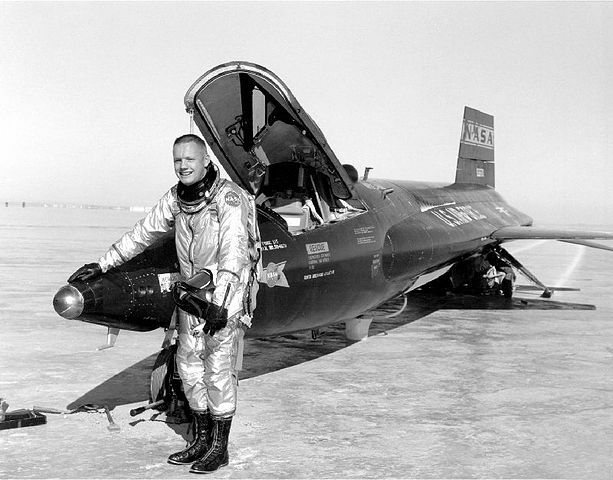 He became a test pilot with what evolved into the National Aeronautics and Space Administration, flying more than 200 kinds of aircraft from gliders to jets. Armstrong was accepted into NASA's second astronaut class in 1962 -- the first, including Glenn, was chosen in 1959 -- and commanded the Gemini 8 mission in 1966. After the first space docking, he brought the capsule back in an emergency landing in the Pacific Ocean when a wildly firing thruster kicked it out of orbit. "But there was that moment on the moon, a brief moment, in which we sort of looked at each other and slapped each other on the shoulder ... and said, `We made it. Good show,' or something like that," Aldrin said. "I can honestly say -- and it's a big surprise to me -- that I have never had a dream about being on the moon," he said.